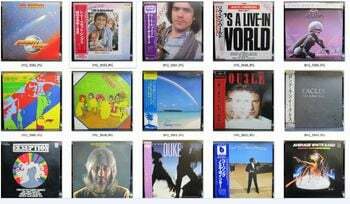 All of our selling stuff are Japan pressing (sorry, no foreign countries products). 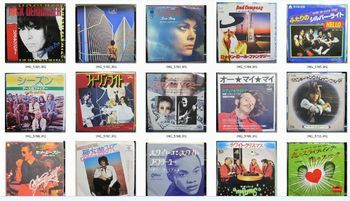 We've been in used records business in Japan since 1998, We specialized for 60's - 70's Rock, Pops, Folk, Garage, Psychedelic, Punk, Power Pop...etc. We have many thousands of records (45's, LPs, CD, 3"CD Singles, movie programs, posters...) not listed yet. Please send us your wants. We can send you photo samples of covers for your requests. Please let us know if you want. Please check the more thorough coverage as shown below. The record is still sealed. It is in brand new condition. Perfect! This record looks like it has just left the manufacturer, with NO flaws what so ever. It looks as though it had never been handled. No scuffs or scratches, blotches or stains. No stickers address labels, writing on the covers or labels. No tears or seam splits. No wear to the cover or record period! Age of the record has nothing to do with it. This record appears virtually flawless A very minor scuff and very little else can appear on the vinyl. It should play without any noise over the flaw. The flaw is very hard to see. The cover looks as close to perfect with only minor signs of wear and or age. Minor impressions to the cover (due to the outer edge of the vinyl resting inside) may be acceptable, however the artwork is be as close to perfect as can be. The record has some marks of having been played, but there is very little lessening in sound quality if at all. The record has been played so much that the sound quality has noticeably deteriorated, perhaps with some distortion and mild scratches, but it shouldn't skip while playing. The record is still playable but has not been cared for properly and displayed considerable surface noise; it may even jump. The record has not been played properly due to great scratches, bad surface noise, jumps, etc. Cover is grading first, disc is second. Our Grading cehck is only for visual checking, not listening. So please inquire to us first when you would like to return or refund. we wont take any responsibilities for shipping troubles(missing, items damaged...) when you select "no-insurance" shipping. Artist Search Title Search Label Search Cat Num Search Barcode Search Genre Search All Formats --------------------- All Vinyl All CDs --------------------- Vinyl - LP Vinyl - 45 & 7" Vinyl - EP Vinyl - 10" Vinyl - 12" Vinyl - 78 Vinyl - Picture Disc --------------------- CD Single Cassette Video & DVD Book Clothing Memorabilia & Misc.